Ophthalmologically approved. Highly effective, immediate UVA/UVB protection against sun coverage and long term UV-induced skin damage. Light & silky smooth skin feeling. Formula with Q10 prevents the appearance of sun induced fine lines, wrinkles and pigment spots. Moisturising face sunscreen, ideal for every day use. 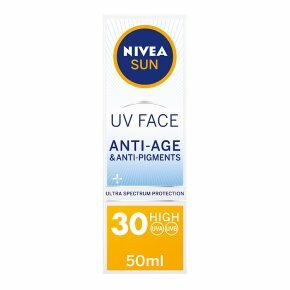 NIVEA SUN UV Face Q10 Anti-Age & Anti-Pigments protects against sun exposure and other UV-induced face skin damage. The Q10 formula prevents the appearance of sun induced fine lines, wrinkles and pigment spots. IMPORTANT USAGE INSTRUCTIONS<br>Apply generously before sun exposure enough to give a visible layer before rubbing in, let it dry then reapply to ensure adequate coverage and no missed areas • Reapply frequently especially after swimming, perspiring and toweling <br>• Applying insufficient product will lower the level of protection<br>• Avoid intensive midday sun (11-3pm)<br>• Wear protective clothing (hat, t-shirt<br>and sun glasses) and use sufficient sunscreen for unprotected areas • Allow to absorb completely and avoid contact with textiles and hard surfaces to prevent staining • Keep babies and young children out of direct sunlight • Even when protected avoid over-exposure to the sun as it is a serious health threat • Skin compatibility dermatologically approved.